What prompts me to write is that a friend and colleague has kindly sent me a copy of your ten-page 'Letter from One Jew to Another' of October 29, 2002. It is a brilliant piece of sustained rhetoric, which expresses as powerfully as anything I have read the currently dominant attitude of the leadership of our people both in Israel and in the Diaspora. But though the facts you cite — as distinct from the generalisations you derive from them — are true enough, you omit a whole lot of other facts, inconvenient to your thesis. That makes your letter an exercise in demagoguery rather than a sober appraisal." We of ALEPH: Alliance for Jewish Renewal strive to open ourselves to awareness of the sacred in all of existence. We strive to create Jewish paths of prayer and meditation, study, communal life-practice, and public action that embody this outlook. We see ourselves in a crucial position at these times of paradigm shift and are committed to help develop a spirituality through which Judaism can transform itself to continued viability in the service of tikkun olam -- the healing and balancing of this planet. Together we affirm principles and values that flow together from the Four Worlds of Being, Knowing, Relating, and Doing. Thank you francis for this informative view and one that makes sense. I'm not sure I would have read it except that you brought it to my attention. Israel has such a wonderful lesson to learn and gift to give to this world when they make peace. And lets not forget Ireland - different history (or is It), same struggle. Thanks for this bit of balance against hysteria and bias. Nuff said. What does Mr Morris say ??? And who is that cat? ;-) Wait a minute! This is Ms Morrissette! I don't think that is Ms. Morrissette. I believe it is Ms.Meowette. says 'Shalom.' Read it from right to left. Shin, Lamed Vav and Mem Sofit (The hebrew letters.) The term 'Shalom' means more than peace. It comes from the root Sh-L-M whose intransitive verb 'LiShaLeM' means to fill up or make full especiall as regards payments from to...It means whole and refers to the concept of 'wholeness' so touted by the New Civ movements worldwide. So to fill up and or make whole. This, of course, generally brings 'Peace.' Hope that helps. 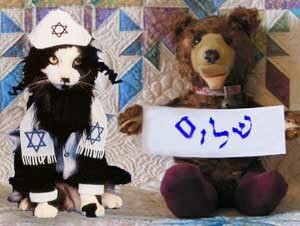 The kitty, dressed as a Hassid, is rather cute. I speak, read, and write ancient and modern Hebrew and spent many years in Yeshivot in Israel learning Kabbalah, becoming MeKubal, and Yahadut...judaism. I was a Breshlaver Hassid accepted by Rabbi Gedalia Koenig and the Israeli Knesset. Enough of my glorious self. ;) Thanks for the great article quid. 29 Mar 2003 @ 06:13 by petavie : This is a sick world ! Thank you Francis for your article, but then this below link. Enough, This is sick, how much more blood? thanks vax for explaining the sign. Shalom has a nice sound and the idea of wholeness is appealing. I am ignorant of jewish terms. After finding the following quote on the Kabbalah I have a question for you. Vax, and anyone else who has studied the Kabbalah, Did the study help you find your true purpose in this life? "Vax, and anyone else who has studied the Kabbalah, Did the study help you find your true purpose in this life"? The Kabbalah is for integration of ALL aspects of human life. It depends of course on how it is used. "The Kabbalah, or Qabalah (an alternative spelling) is a unique way of understanding all aspects of ourselves and is a rewarding guide for personal and spiritual development. It is at the heart of the Western Mystery Tradition, and is based on a map of consciousness called the Tree of Life." Kabbalah is much more than a simple 'glyph.' Kabbalah means 'the received.' It especiall refers to the 'Torah Sh' Beal Peh' Which means the 'teachings or law' which come by word of mouth.' There is a common mistake that 'Kabbalah' is something outside of and seperate from Yahadut or Judaism. This is not so. It is rather the crown and culmination of the whole...It has also been called 'Jusaisms (Yahadut) Mystical tradition.' It is much more than the word 'mysticism' implies as the received tradition or Torah Sh' Beal Peh is the essence of that Ocean of teaching called Yahadut or Judaism. There is no 'ism' in Yahadut. ;) My answer to you martha is 'no.' Pardon the digression Francis. Well I have enjoyed this short discussion and appreciate the honesty and candor of bbee and vax and clarification from shakti and vax. I believe it is no small task to find one's gift in their present life. And knowing there are many ways to seek I was curious about the Kabbalah. For future reference Vaxen, if I may be so bold, Francis likes digression. It's part of the process and he recognizes and encourages it. Though sometimes he is slow to catch on. Think he is busy cooking at those times. Or playing on his computer putting makeup on Mr. Morris Bear. And aren't digressions the very stuff of which NCN is made? As those things go, this was a most surprizing and refreshing one---truth is I was holding my breath for fear of breaking the magic. It is moments like this that serve to remind me that we all have much more in common than it might sometimes seem and are all a part of "THAT", which we create and which creates us and is bigger than us. We are all strange here, but strangers we are not! For those with the sincere intent to truly delve into the wisdom of the sacred Jewish kabbalah, here is an authentic "kosher" website for you all. www.kabbalaonline.org Start with the beginners section and see where it takes you.